"As we strive for perfection, we’re continually working on innovating new ways to keep our device screens’ protected. 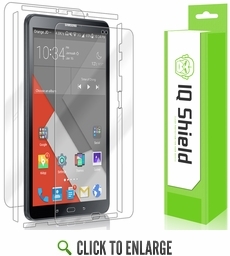 Along with our IQ Ultra Shield, we also engineer protective film that utilizes liquids during installation. The bottle of “installation solution” provided will allow you to easily slide your screen protector on your Samsung Galaxy Tab A 10.1 (2016, SM-T580) surface, providing an easier, more precise installation.